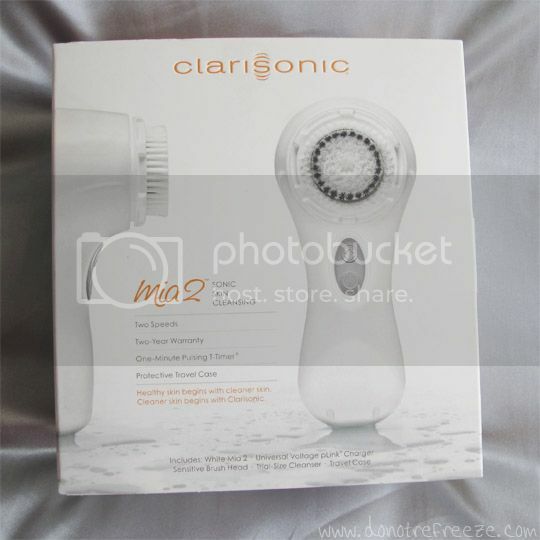 I was VERY excited when my dad got me a Clarisonic Mia 2 as an early birthday present on my parents’ most recent trip Stateside. I’d been toying with the idea of getting a Clarisonic for months, but there’s no way I was paying full price for it in the UK. As far as I can tell, the only real difference between the Mia and the Mia 2 is that the Mia 2 has two different speeds as opposed to the orignal Mia which has just one. I tend to use the higher speed but being completely honest, I don’t think there’s an awful lot of difference between them! I am absolutely loving the Clarisonic. I’ve been using it for about 6 weeks now. I was fully prepared for a breakout when I first started using it as I’d heard that many people do get a bit spotty at the beginning, presumably due to the Clarisonic purging your skin of all the crap that isn’t as effectively removed with traditional cleansing. Surprisingly though, I didn’t actually notice anything out of the ordinary blemish-wise, indeed it has been slowly but surely improving the overall condition of my skin so far. I was using it nightly for the first month or so but more recently I’ve gone down to every other day which seems to be just as effective. I’ve mentioned many times before on the blog that my skin is exceptionally oily, yet still suffers dry patches wherever it fancies. The worse places for dry, flaky bits on my skin are the top of my nose between my eyebrows, and around the sides of the nose. I ignore the intermittent beeping emitted by the Mia 2 which tells you when to move on to another area of the face, and just concentrate more where I feel I need it on that particular day and that’s been working out great for me. One of the best things about the Mia 2 is the free carry-case that comes with it – a Clarisonic shaped plastic box for easy and safe travelling. This is especially handy for me with my regular to-ing and fro-ing between London and Essex! 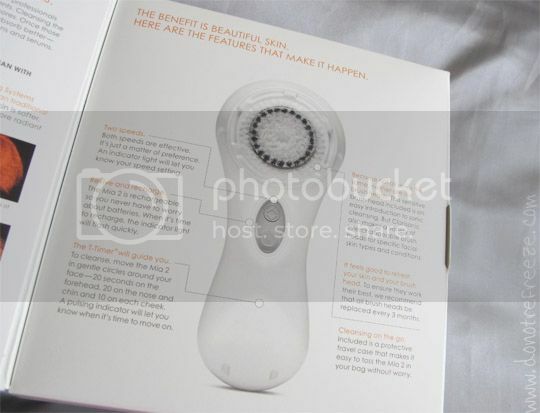 As for cleansers… I own rather a few and have had fun trying them all out in conjunction with the Clarisonic. Pictured below are my 5 favourite cleansers for using with it. :: LP Skin Therapy System Balance Facial Wash* – There’s some really lovely products in this skincare range by Dr Linda Papadopoulos. This cleanser contains Biotin, a pro-biotic ingredient that works with your skin to promote a natural balance of moisture. I really, really like the way my skin feels after using this, especially followed by a spritz of the Uplifting Toning Water* from the same range on a hot day. 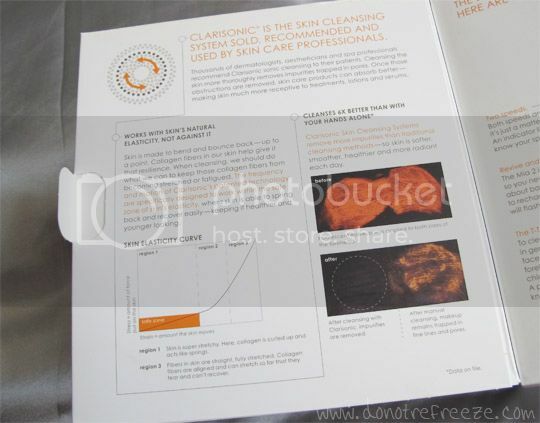 :: Decleor Aroma Cleanse – I think this one gives my face the ‘freshest’ feeling of the lot. I’ve always been a big fan of this, receiving it first as a PR sample in 2010 and having since purchased it myself. It lasts an awfully long time although I don’t find it really foams like it claims to. It’s incredibly rich in moisture and I don’t always feel the need to moisturise after using it. 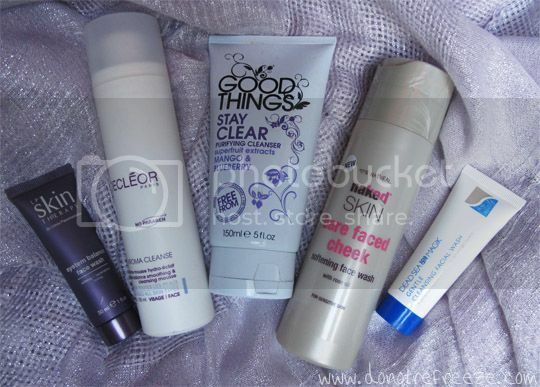 :: Good Things Stay Clear Purifying Cleanser – Cheap and cheerful and AWESOME. I love the Good Things range, it’s wonderful for young and oily skins. I prefer this one when I’ve had a particularly oily day, the fruity scent is lovely and it’s even better when followed up with the Good Things Miracle Mattifier moisturiser. :: Naked Skin Bare Faced Cheek* Softening Face Wash – Originally I was apprehensive about trying Naked skincare since I didn’t get on with their haircare at all, but I’m quite enjoying this one, it leaves my skin feeling super soft. The rose scent isn’t my favourite but it does feel like it’s giving the skin a really good clean and the smell fades quickly. It feels exceptionally gentle and I assume the high quantity of natural ingredients would make it a winner for sensitive skins. :: Dead Sea Spa Magik Gentle Cleansing Facial Wash* – This is one of my favourite things that’s ever been in a Glossybox, and the trial size has been lasting me for ages. I’ll definitely pick up a full size when this is gone – when used with the Clarisonic it creates a really creamy but deep-cleaning lather. Lovely stuff! Do you use a Clarisonic or do you prefer a traditional cleanse? What are your favourite cleansers? I have a Hydroxatone microdermabrasion brush that I am pretty in love with. I can’t find a UK stockist, but think it retails in the US for about $60. I’m gon’ Tweet you a question or two about this bad boy! 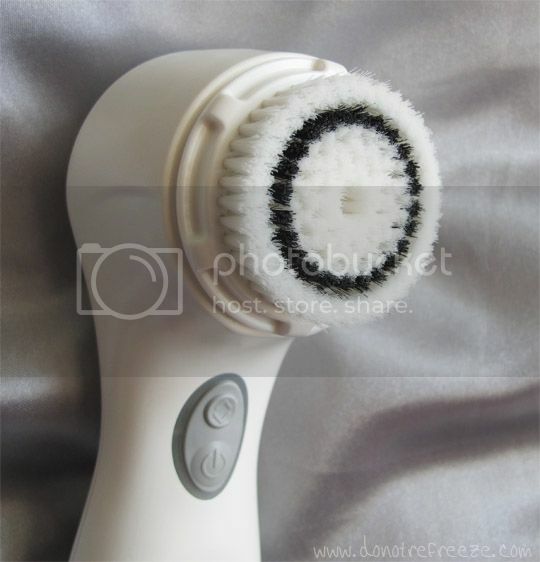 LOOOOOOOOOOOOOOOVE my Clarisonic. Don’t know how I ever lived without it. my fav cleanser (I’m in the US) is the Origins Checks and Balances. I have skin very much as you describe yours. This lathers nicely, but doesn’t strip it.